My Windows 10 in running with Secure Boot and is fully-encrypted. I'm too afraid to dual-boot on it... I think I did such thing once with Windows Vista and Ubuntu. I'll see what I'll do. Don't resort to dual booting yet! I've figured out a way to do this from a bootable CD or USB. I am writing up instructions now, and will post them in a while. Quick progress update. I have created a bootable ISO image which has wine already configured, and has links on the desktop to GSCC and WinROM64. This means there will be a very small number of setup steps (basically just configuring the computer-specific address and IRQ settings for /dev/parport0), then you can start using GSCC right away. Doesn't require installing a second OS or using a VM. It is built on Lubuntu 12.04, so it should run on even very old pre-Pentium M computers up through modern computers that have a parallel port. I've tested on a bootable USB and it works well. I've kept the image under 4 GB, so that it can be burned to DVD as well (since a lot of old computers are not able to boot from USB). I haven't tested booting from DVD yet (have to make sure it will run fine on a read-only file system). Once I finish those tests, I'll post the ISO and configuration instructions. Another progress update. Since my last post I learned that a true ISO image is in a read-only format called ISO 9660. This means the output from "dd" is only a true ISO if the source is an optical disk. Unfortunately, the output from dd with a hard drive or USB stick as its source cannot be easily burned to an optical disk. It can only really be dumped onto another hard drive or USB stick (by simply running another "dd" command with the source and destination flipped). In order to get a true ISO image that can be burned to a bootable DVD, things are a bit more complicated. I found this guide on Ask Ubuntu, and just finished stepping through it. My resulting ISO image however crashes after the Lubuntu splash screen, so I must have done a step wrong somewhere. I've tried booting it in different modes, and from different machines, but all are having the same problem. I'm going to try re-running the process from the beginning once more. It took me a couple hours to get through the process the first round (granted, I was spending some time on each step Googling to learn its purpose). If I can't get this working today, I'll post the output I have from dd, along with instructions for dumping it onto a USB stick. Hopefully your computer is able to boot from USB.. if not, you may have to wait a while until I can generate a true ISO. My computer is very recent and I think it can boot from USB, yep. I haven't gotten the ISO working yet, so I'll go ahead and post the bootable USB thumb drive solution for now. First, you'll need to have a USB thumb drive that is at least 4GB or larger. This process will completely erase its contents, so be sure to backup anything you might have on it before starting. Second, you will need Virtual Box with a Linux guest installed on it (I used Lubuntu to write the instructions below, but the process is virtually the same for Ubuntu if you have that as a guest instead). We will be using Linux for the "dd" command used to build the thumb drive. There are Windows programs that could do this as well, but I am more familiar with Linux. You can always delete the guest or completely uninstall Virtual Box when you are finished if you need to save space. Download the n64gscc.raw file. I have set up a room on SpiderOak called N64 Utils where you can find a link to download it. Once the file has been downloaded, copy it onto your thumb drive. We are going to use the thumb drive initially to transfer the file into the Linux guest machine in VirtualBox (alternately, you could just download the file from inside the guest machine rather than from the host). Now start up the Linux guest machine. Once it has booted, open the thumb drive folder and drag the n64gscc.raw file onto your desktop. This will take a long time to complete, so be patient. In GParted, find your thumb drive in the drop-down selection at the top-right corner. It will typically be listed as /dev/sdb but make sure it is the same for you (you can use the name and/or size to identify it. Note if the letter for your thumb drive is not /dev/sdb (for example /dev/sdc or /dev/sdg). You will need to know this later. If your thumb drive has more than one partition (which would appear as multiple partition rectangles instead of just one), repeat the above steps to delete all of them. 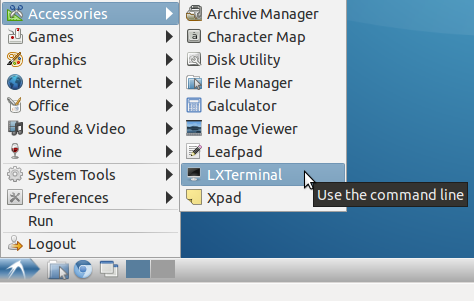 Next, open up the terminal again (Accessories->LXTerminal). Enter the following command. NOTE: if you saw in the previous step that your thumb drive was some letter other than /dev/sdb (such as /dev/sdc or /dev/sdg), modify the command to match. The above command will take a very long time to finish, so be patient. When it is complete, shut down the Linux guest machine. Your thumb drive should now be ready to use! 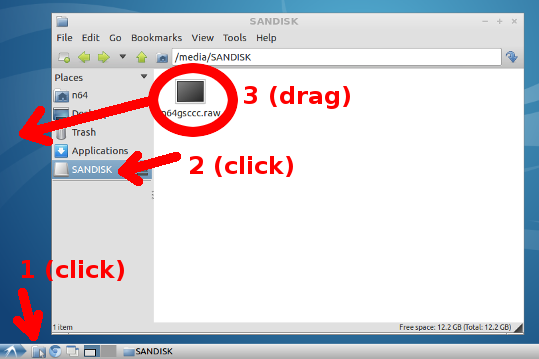 If there is, right-click on the first partition and select "Check". Click on the green check mark icon to apply the changes. If your thumb drive is larger than 4GB, there will be a lot of wasted space after running the above process. You can make this area available for everyday use (so that your thumb drive doesn't have to be dedicated to only running the N64 utilities). 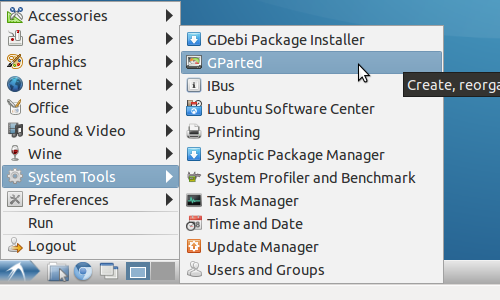 To do this, launch your Virtual Box Linux Guest (with thumb drive plugged in), run GParted (System Tools -> GParted), and select your thumb drive from the dropdown on the top-right (typically /dev/sdb). Click "Add", then click the green check mark icon to apply the changes. 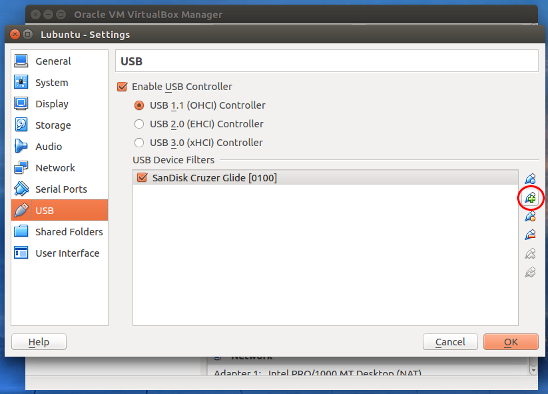 If you want to completely remove the utilities from your thumb drive and restore it to its original (empty) state, start up your Virtual Box Linux Guest (with thumb drive plugged in). 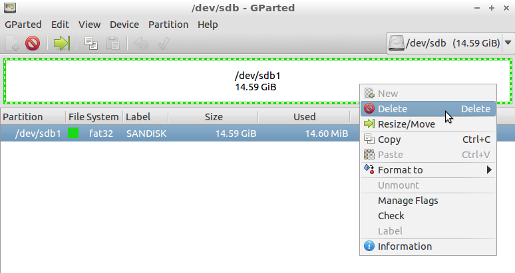 Once it is loaded, launch GParted (System Tools -> GParted), and select your thumb drive from the dropdown on the top-right (typically /dev/sdb). 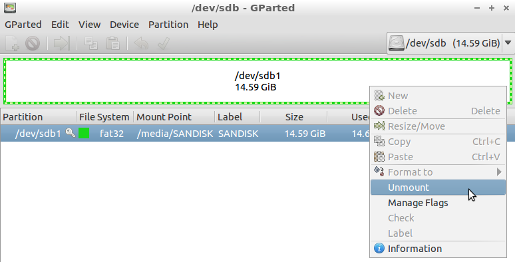 Right click on any partitions and choose "Delete". Click the green check mark icon to apply the changes. The rectangle should now show only empty (unallocated) space. Click "Add", then click on the green check mark icon to apply the changes. Once you have successfully built your USB thumb drive, begin by restarting your computer and booting from it. How to do this will depend on your particular system. Typically you press some key during bootup that brings you into the bios settings, and there will be either a boot menu where you can boot from the thumb drive directly, or there will be a boot order list where you will want to move the thumb drive up to the top. During bootup, you may see some strange graphical artifacts or the screen may go black for a while. This is just Lubuntu adjusting to your computer's hardware. Give it a little time, and it should eventually bring up a Lubuntu desktop. If it never boots up, let me know. I've only tested on three computers here, so I can't say how robust this is..
For the below instructions, use the password "gscc". Once the parallel port is configured, open the GSCC app to launch GSCC via Wine! If you see an error message when you open the Configure LPT app, you will need to set up the parallel port manually. If this does not produce any output, then continue. I'll add more info as I follow your guide. More to come. Oh, good catch I forgot about that step. Mine was MSDOS. Let me know if it works with GPT or if you have to go with MSDOS, and I'll update my instructions. Ok, let me know if you can't get it to work. I can make a newer version based on latest Ubuntu LTS rather than outdated Lubuntu version I used for this one. This older version is meant to support old computers (pre- Pentium M). These last few days I've tried, and failed to get a dumping setup of my own so that I can legally play my own ROMs. Before installing Windows XP on this machine, I tried your Lubuntu image. I managed to get it on a USB drive (using Disk Utility and the dd command on OSX instead of using Gparted on Linux). It boots up, I click on "Configure LPT," it says that it was successful, but GSCC can never find the port. It always says that communication timed out. When this was a dead end for me, I decided to try the Windows XP route. Unfortunately that's the earliest version of Windows I own so I had to go with that. I got the tools loaded up on this machine with a bit more success. This time GSCC finds the correct address in the Configuration section, and even will begin to dump the game. I can see the lines spinning on the GSPro indicating that I/O is in use. However, after a seemingly random amount of time (usually 30 seconds or less), the spinning icon on the GS will stop, and GSCC will tell me that the communication timed out. The only resort is to reboot the N64 and try again. I've done this about 30 or so times, and it always fails. It's not ever completed the dump past say, 15%. 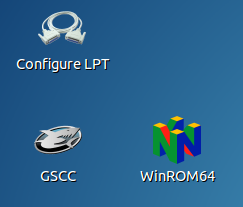 I've tried different versions of GSCC, checking the "compatibility mode" on the executable, updating the BIOS to the latest version, changing the Parallel port BIOS settings, etc. I'm out of options at this point and don't know where to go. It wasn't easy for me to procure this old hardware, and if I can't get this working, I'll likely just give up on the project. Any help would be greatly appreciated! EDIT: I decided to check all of my connections again and do the good ol' "blow into the cartridges" trick, and what do you know...I'm dumping games now! So far I've dumped about 6 games. FYI, I'm dumping in the Windows XP environment. Some games do not boot with the GameShark, since I think I need a specific "key code" to load those games. Awesome work Paul, thanks for all of the documentation and help! Yeh, it seems that "fool proof" USB image isn't really very robust. I only have two computers with LPT ports to test it on, so no doubt I haven't covered all (or probably even most) configurations that can be encountered. I just need to finish writing my own ROM dumping application rather than relying on these ancient ones. In my own experience, GSCC running on Windows XP tends to be much less stable than on Windows 98 or WINE, but it does work if you are persistent. Glad to hear you were able to get it going. Yeah, I think it's a great start and a perfect place for people to start. I'm still unsure why it didn't work for me - maybe Lubuntu simply was not compatible with the parallel port hardware? When querying the hardware, I did see "parport0" so I'm really not sure. Since I had so much success with my setup (I successfully dumped my entire game library - 26 games - with absolutely zero issues after the initial problems), I figured I'd give as much detail as I can about my setup. Windows XP 32-bit w/SP3. No other Windows updates have been applied (past SP3) since it has yet to be connected to the internet. If anyone has any questions or runs into any issues, feel free to let me know. Also, I have another one of these laptops available that may or may not be functioning. If anyone here has any interest, I can check to see if it still works. If it does, I'd gladly give it to someone as long as they're willing to pay the shipping. However, I do have a question for Paul (or anyone else) about verifying dumps. I did the CRC check in WinRom64 and about 8 or so of them come back with bad CRC check (with the option to fix it). I did not fix them yet, but I verified that they still run in the emulator I'm using (OpenEMU on OS X, which uses mupenplus as the core). Should I redump these games that have invalid CRC? EDIT: I did another dump of one of the culprit games (Zelda OOT) and I got the same exact "bad" CRC. Recently came across an old Netmos MP9835 dual serial/parallel PCI card and I have successfully dumped an N64 ROM using this. I tried first in Ubuntu but I could not get GSCC to pick up the port correctly. For some reason Ubuntu thought I had two parallel ports. I ended up using this card with Windows 7. Amazingly, this chip has actively updated drivers even for Windows 10. I just spun up a Windows 98 VM in VMware, gave it LPT1, and GSCC worked out of the box and even autodetected the settings correctly. I will try this in a Windows XP VM later, but this appears to be another viable way to dump ROMs and use all the features of GSCC on more modern computers.